If you stepped outdoors today, the first thing you probably noticed was how cold it was compared to yesterday. With a high of just 36 degrees we spent most of the day in below freezing temperatures, likely the beginning of a trend over the next few days. Thanks to the high pressure system that has remained over the region the last few days, our skies were clear however, and winds were relatively light. 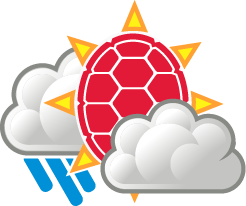 Expect temperatures tonight to remain below freezing, with a low of 26 degrees expected by tomorrow morning. Winds will remain light as well, and with the high pressure still over us, we can expect no precipitation although cloudiness will develop overnight. You definitely will want to bring a nice winter coat if you’re going out tonight. And now we hit the part of the forecast everyone has been eager to find out about. 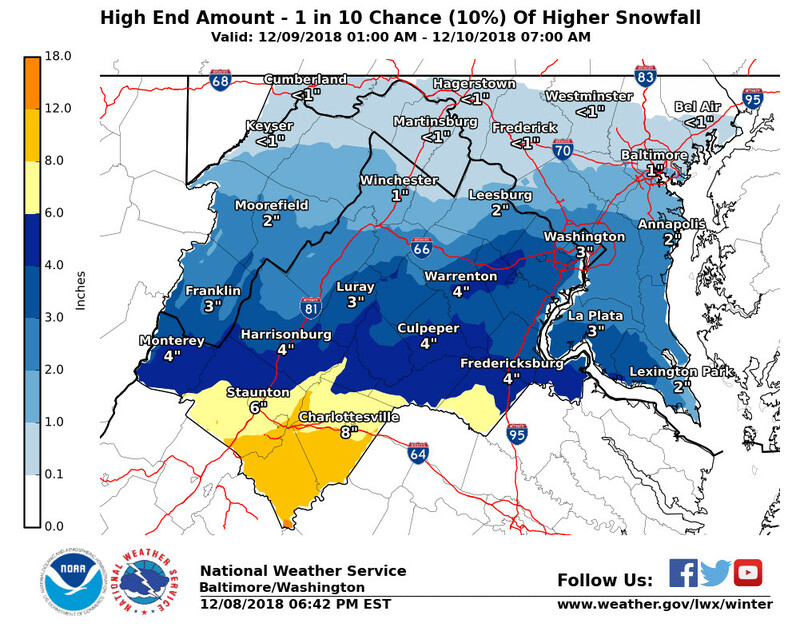 The short story here is that odds are, College Park or indeed any area west of I-95 will likely see little no no snow. But as with any forecast, whether this pans out or not depends entirely on whether the anticipated atmospheric conditions actually develop. As it stands right now most of the necessary components needed for the region to receive snow will be in place or already are in place. Surface temperatures will likely peak around 37 degrees tomorrow but with a low of around 27, temperatures will mostly be below if not near freezing most of the day. At the 850mb level the air above will be more than adequate for snow type precipitation instead of sleet or freezing rain. But there is just one thing that’s missing from this picture compared to forecasts from a few days ago or even a week ago. Up until the middle of this week, most forecasting models depicted a system moving far enough north that we would receive snow. Unfortunately that system will likely move well to our south, leaving only a slight chance for snow for Southern Maryland and Northern Virginia. Even in these two areas, snowfall (if any) will likely be light, with less than an inch accumulating and perhaps even just flurries. Of course, there is still a chance the system could well move farther north than anticipated, but if it did, snow totals would still be meager at best. 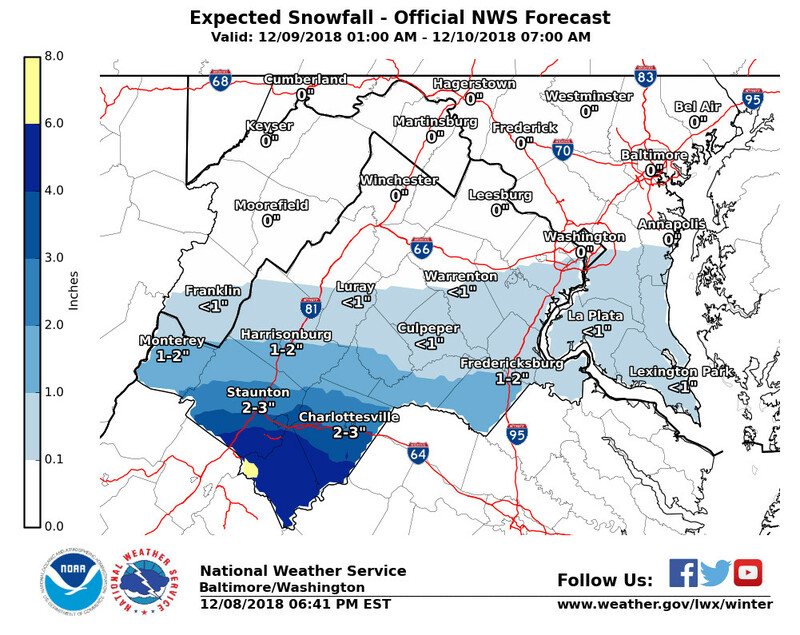 And as if this news wasn’t bad enough for our snow lovers out there, the latest runs from several mesoscale models reveal temperature profiles that would produce rain for Southern Maryland while Northern Virginia remains bone dry. These mesocale models are much better at forecasting expected precipitation types and totals in the near term than the medium and long range models available to us before. So although you may still hear people talking about some long range models depicting snow for the region, it is unlikely those forecasts will verify due to the higher resolutions provided by mesoscale models as well as differences in how accurate weather processes are modeled. Expected snowfall totals, as projected by the National Weather Service. Those areas projected to receive less than <1 inch could very well just receive flurries and no accumulation. Courtesy of the National Weather Service. Here we have the high end for possible snowfall totals, with the odds of such an even occurring being just 10%. Even so, snowfall west of I-95 still remains almost non-existent in Maryland at least, although the eastern side could receive snow accumulation. Courtesy of the National Weather Service. As for our week ahead it would seem we already have another system that could be in the works around Friday, although at this time it seems the precipitation type will likely be rain. As always this could change however so it will be something to keep an eye on. Other than Friday expect temperatures to increase into the 40’s and 50’s as the week progresses. Low’s should also rise into the lower 30’s, something much appreciated after our recent journey into the mid 20’s over the last few nights.